I am SO excited! Today is THE DAY! The day I share my biggest blogging project yet! 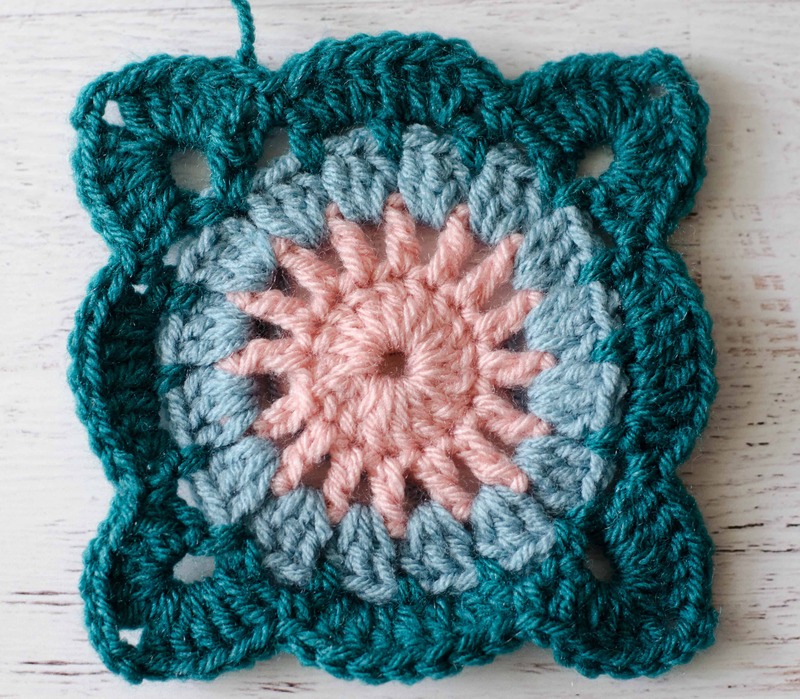 Meet the Happily Ever Afghan Block! I designed this amazing afghan as a wedding gift for my son and daughter in law. I’m sharing everything here on the blog in a 4 part series. In Part 1, I talked about planning an afghan from an inspiration piece and how to calculate how much yarn you need. Here in Part 2, I will give you the pattern for the block. Part 3 is all about the beautiful braided join technique and Part 4 wraps it all up with a beautiful border. All free to you! But first… a little background on what inspired the name of the afghan. My husband and I have this little thing we do. We have this cute, small block style wall hanging. It is probably about the size of the palm of your hand. 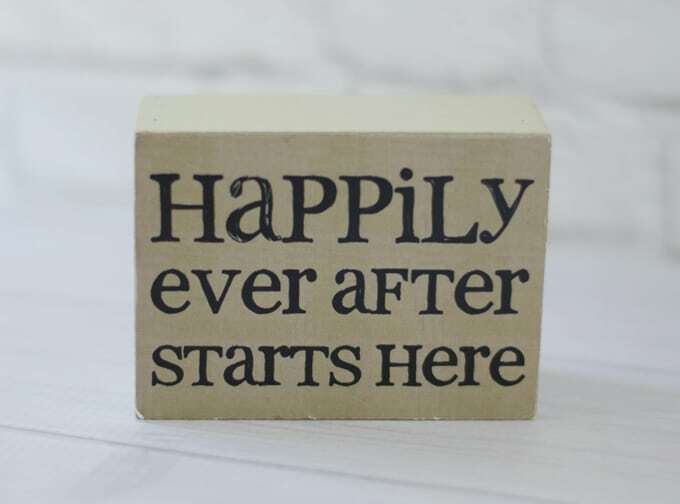 We got it sometime before we were married and I can’t quite remember if it was a gift or one of those spontaneous purchases I tend to make when visiting Hobby Lobby. It doesn’t have a permanent spot in our house because we constantly hide it. I will hide it for him to find and then when he finds it, he doesn’t say a word, but hides it for me to find later. We don’t verbally acknowledge finding it; just hide it again for the other to find. So sometimes this moves quite actively around the house and then other times it is MIA for months at a time if one of us hid it in a really great spot. Sometimes I tease him that he hides it to see if I’m dusting–because that’s when I tend to find it..hiding behind a clock or knick knack. It’s just a little way to say ‘I love you’. What little thing do you and your spouse do something fun to say ‘I love you’? Tell me about it in the comments! I’d love to hear! 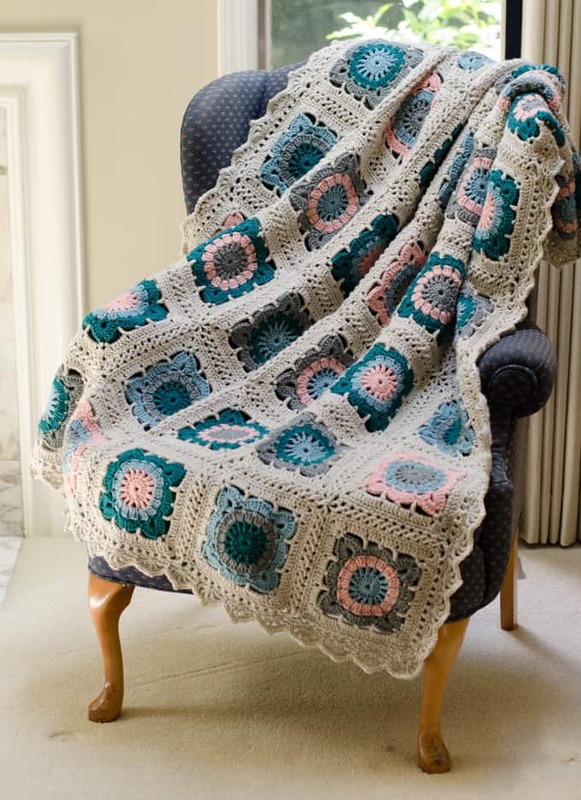 So when this afghan was done, calling it the ‘Happily Ever Afghan’ just seemed to fit. So let’s get to the Happily Ever Afghan block! With Color 1, ch 5 and join to form a ring. R1: Ch 3 (counts as 1st dc), 15 dc in ring (16 st), join with sl st to 1st st.
R2: Ch 4 (counts as 1 dc, ch 1), *dc in next dc, ch 1*, repeat * to * around, joining with a slip stitch into 3rd ch of original ch 4. Fasten off yarn. R3: Join color 2 in any ch-1 space in previous round. Ch 3 (counts as 1 dc), 2 dc in same space, *3 dc in next ch-1 sp*, repeat from * around. Join with sl st to 1st st. (16 groups of 3-dc clusters). Fasten off yarn. R4: In this row, you will be working in the spaces between the 3dc clusters from the previous row. Join color 3 in the space after any cluster. Work sc, ch 5, sc in same space as joining (1st corner made), *ch 3, sc in next space*, repeat * to * 2 more times, ch 3, **work (sc, ch 5, sc) in next space (corner made), *ch 3, sc in next space*, repeat * to * 2 more times, ch 3**, work ** to ** 2 more times, sl st to starting sc. R5: Slip stitch in next ch-5 sp, ch 3 (counts as 1 dc), in same space work (4 dc, ch 3, 5 dc), *sc in next ch-3 sp, 3dc in next sp, dc in next sc, 3dc in next sp, sc in next sp (5 dc, ch 3, 5 dc) into next ch-5 sp. * Repeat * to * around, ending before last corner and joining with a sl st to top of 1st st. Fasten off color 3. R6: Join main color to any corner space and work ch 1 (1sc, ch 3, 1 sc) in corner. *ch 5, skip 5 dc, 1 dc into next sc, ch 3, skip next 3 dc, 1 sc in next dc, ch 3, skip next 3 dc, 1 dc in next sc, ch 5, skip 5 dc, (1 sc, ch 3, 1 sc) into next corner ch-3 sp*, repeat * to * around, ending before last corner and joining with a sl st to the 1st st.
R7: sl st into next ch 3 sp, ch 3 (counts as 1 dc), [2 dc, ch 2, 3 dc] into same space (1st corner made), *5 dc into next ch 5 sp, 3 dc into next ch-3 sp, dc in next sc, 3 dc in next ch 3 sp, 5 dc into next ch-5 sp, [3 dc, ch 2, 3 dc] into next ch 3 sp (corner made)*. Repeat * to * around, ending before last corner and joining with a sl stitch to the top of 1st st.
R8: In this round, sc in each st around, working 3 sc in each corner. Fasten off yarn. 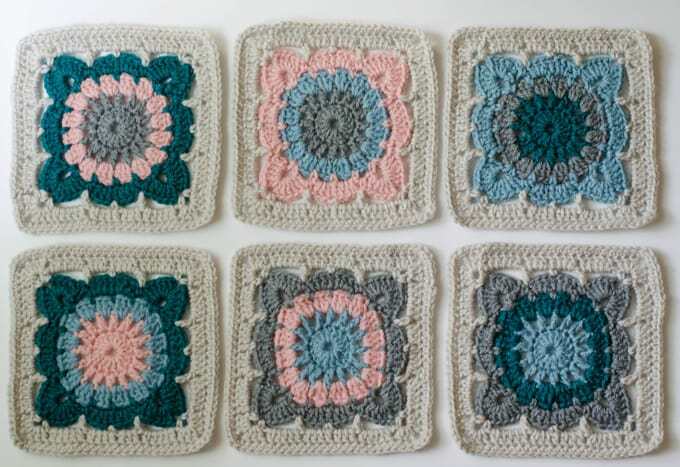 Here are the 6 color combinations of the Happily Ever Afghan Block. Remember to make 7 of each color way. And here’s a sneak peak at the completed afghan! Next up, I will show you the very pretty braided join! 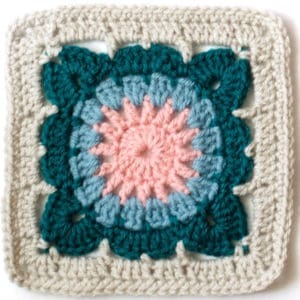 Let me know if you are trying this pattern and how you like the Happily Ever Afghan Block. Leave me a message in the comments or post a picture on Instagram and tag me! I’d love to see your progress! Your work is gorgeous! I have been crocheting for quite a few years but just recently I have been working on refining my craft. I used to leave small errors in thinking no one would notice. I realized I would notice so I thought it was about time to correct that lazy habit! I am getting ready for a church crafts faire in my neck of the woods. I have created a travel ghan, an afghan a bit smaller than your regular size afghan to keep in the car, etc. I have a carry on poly bag with handles to make the travel ghan even more convenient! I do hope they will sell. I recently was let go at the place of my employment and began to create baby blankets (both afghans and flannel blankets with crochet trim) to give to facilities that take care of pregnant women that have nowhere to go. I figured that society was very nice tome while I worked and it was about time I gave something back! The creating, the making, the mailing and the thank yous were all so worth it. Thanks for your kind words! I love how you are giving back to your community! And I think your travel ghan is a wonderful idea. My side of the car is quite cold in the winter so I often tuck an afghan around my legs. A travel ghan would be just perfect! I hope it’s a great seller for you! Cheryl this is a beautiful piece of work. 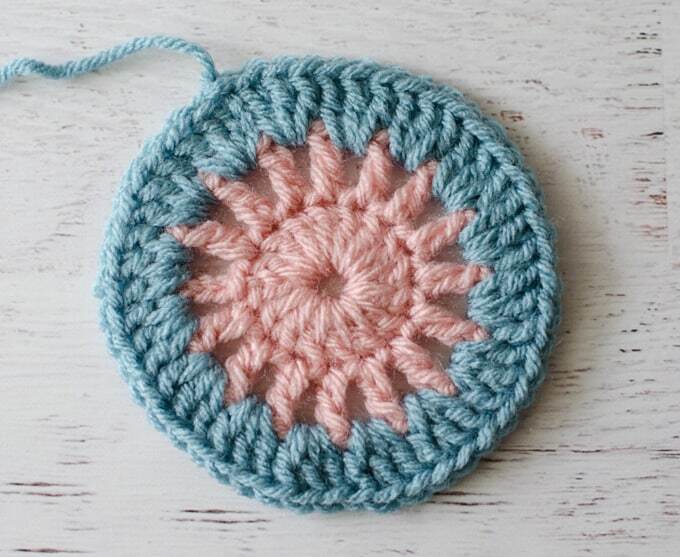 I have been looking for my next blanket project for the winter months. I have found it. Thank you so much for sharing your work and snippets from your life. I need to get my other projects finished before I start this but I already have the yarn stashed away ready. I found your Happy Ever after afghan its beautiful!! I was reading the rounds of each block ,different colors i read the block instructions the crochet block it doesnt have 8 rounds , the blocks have 4 different colors thats all something isnt right. I need help to figure it out sorry to bother you. I will be waiting to hear from you. Could you send me pic of the blocks see what it looks like?? The first photo in the post shows the completed block. Some colors are worked for more than one round. Hope that helps. Would you recommend blocking the individual squares or the blanket when it’s completed? If you’d like to block, it’s probably easiest to do each block separately before assembling.